We are all looking for a little help in the kitchen, and I am not just talking about an extra pair of hands to assist with prep work. But with a few reliable starter dishes at the ready, weeknight dinner prep can be simple. Not to be confused with appetizers, starter dishes are the fundamentals for meal planning, the catalyst for creating new main and side dishes. Think about roast chicken: This starter dish not only yields Sunday dinner, but its leftovers can also serve as base ingredients for salads, soups and quesadillas. Although meat is an obvious choice, don’t overlook the possibilities with fresh produce. Fruits and vegetables are especially useful for starter dishes. Sauted green beans or cooked corn, for example, can build a host of salad possibilities or as filling ingredients for made-at-home omelets. Anything freezer-friendly wins big points in this department. 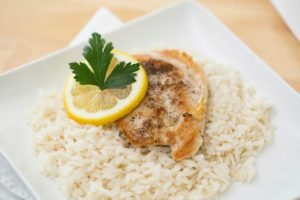 Consider the convenience of being able to thaw a prepared dish in your refrigerator during the day and use its contents to put dinner on the table in a matter of minutes. Season chicken with 1 teaspoon each of salt and pepper. In a large skillet over medium heat, heat 2 tablespoons olive oil. 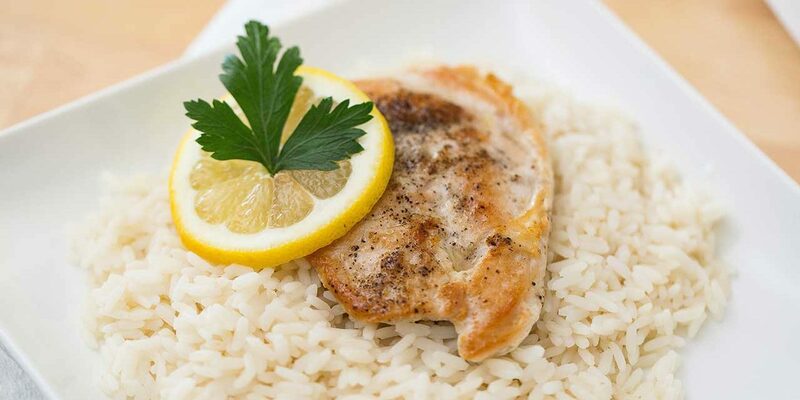 Place half the chicken breasts in skillet and cook, searing on one side for 3 minutes. Turn and sear on opposite side, about 3 minutes. Transfer chicken to a plate. Cut lemons in half lengthwise and then into thin slices crosswise. Add remaining 2 tablespoons olive oil. Add onion and garlic to skillet; cook over medium heat until soft, about 2 minutes. Add lemon slices, stock or broth, and 2 1/2 cups water. Bring to a boil, reduce the heat and simmer for 12 minutes. Place chicken on top of the vegetables. Sprinkle with oregano, thyme and red pepper flakes. Cover and simmer until chicken is just cooked through, about 16 to 17 minutes. Remove skillet from heat and let chicken cool. Serve immediately; transfer each piece of leftover chicken to its own individual freezer bag; divide cooking liquid among bags and freeze until ready to use (will keep about six weeks in the freezer). Makes 8 servings. Preheat oven to 350 degrees F. Butter a 1 ?-quart casserole dish; set aside. Bring a large pot of salted water to a boil. Cook pasta according to package directions; drain and set aside. In a large saucepan over medium heat, melt butter. Add garlic and cook for 30 seconds. Stir flour into melted butter and cook until no traces of flour remain, about 2 to 3 minutes. Add milk and cook until mixture is thickened and bubbling; reduce heat to medium-low. Add grated cheeses and stir just until cheeses are melted. Remove from heat. Stir in cooked pasta and parsley. Spoon mixture into casserole dish; top with bread crumbs. Bake, uncovered, for 22 minutes. Sprinkle with grated Parmesan cheese, and bake for 5 minutes. Let stand for 10-12 minutes before serving. Refrigerate or freeze any leftovers and use within 1-2 days. Makes 8 servings. Peel and cut potatoes into 1-inch-thick pieces. Place in a medium saucepan and cover with about 2 inches of cold water. Add 2 teaspoons salt. Bring to a simmer. Place a separate saucepan or the bottom of a double boiler filled with water over low heat. Cook potatoes until the tip of a knife slides in and out of the potatoes with no resistance. Drain potatoes in a colander. Place the milk in a small saucepan over medium heat. Stir potatoes until smooth, then add butter. Drizzle in the hot milk, stirring constantly. Add pepper and salt to taste; transfer potatoes to mixing bowl and place bowl over water-filled saucepan or double boiler bottom to keep warm until ready to serve. Serve immediately. Refrigerate any leftovers and use within 1-2 days. Makes 4 to 6 servings. Use the mashed potatoes to make quick-and-easy potato patties. Combine 2 cups chilled mashed potatoes with 1 beaten egg and 1/3 cup cooked, chopped scallions. Shape into 4 round patties. In a nonstick skillet over medium heat, melt 2 tablespoons butter. Cook patties for about 5 minutes on each side or until golden brown. Serve with salad or use the cooked patties as the bread to hold a homemade tuna salad filling. Spread leftover macaroni cheese on a baking sheet, refrigerate or freeze until cold and use it in baked macaroni and cheese sandwiches, a creation inspired by Chef Heidi Gibson of the American Grilled Cheese Kitchen in San Francisco. Preheat oven to 500 degrees F. Butter one side of a bread slice; top the opposite side with a slice of cheese. Arrange leftover macaroni and cheese mixture on top of cheese; top with another slice of cheese, followed by a bread slice, buttered side up. Place on a baking sheet and bake sandwich for 1-2 minutes. Spread leftover macaroni and cheese over a prepared, thawed, frozen pizza crust for a macaroni and cheese pizza. In addition to the most familiar way to use mashed potatoes, as the topping for shepherd’s pies, other uses include mashed potato croquettes (roll mashed potato mixture into balls, dip in beaten egg, roll in bread crumbs and fry in a nonstick skillet) and mashed potato gnocchi. To make the gnocchi, combine about 2 cups of mashed potatoes with 1 large egg yolk and 1 cup all-purpose flour. Stir until the mixture comes together and forms a dough. Roll dough into a log and cut the log into even-sized pieces. Shape into small crescents with a fork and transfer to a saucepan filled with lightly salted boiling water. Cook gnocchi in batches until they float to the top, about 2 to 3 minutes. Serve cooked gnocchi with your favorite pasta or tomato sauce. Use cooked leftover Lemon Chicken as the filling for stovetop quesadillas or place over cooked spaghetti (use the cooking liquid as the sauce). Cube cooked Lemon Chicken and place in individual ramekins or custard dishes with vegetables and chicken gravy. Top with a piece of pastry crust to create individualized chicken pot pies. PreviousWhat 19th-Century British Melody is the Basis of Our National Anthem?